Since I started writing my memoir ten years ago, I have not struggled with writer’s block. It’s true, I have produced drafts of my second book that were so bad, I scrapped them. But I was always able to use writing to help organize my thoughts without feeling defeated. Sure, I have taken a few vacations, but I always did that with a project or two on my mind. Today, however, I cannot get a project started. For the past few days, I have been chewing things over in my mind and I feel totally frozen. I retreat in great frustration with my wife Barbara and my dog Jayla through the smoke-filled Bay Area. We drive out to the coast adjacent to Half Moon Bay. 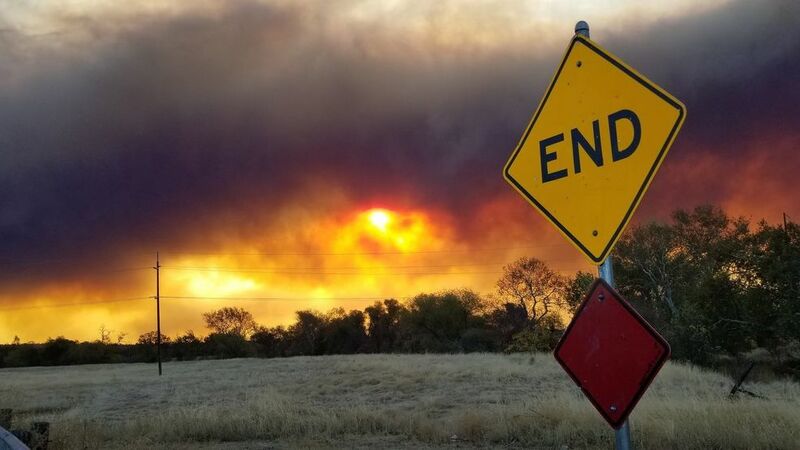 As the Camp Fire rages hundreds of miles to the north, I spend the drive trying to figure out what was happening to me to get me feeling so stuck. It is true I recently heard from a high school English teacher who used to support me who read my memoir. She made a point of sending word through my mother that she was impressed with how I was able to get into my own head: had I ever considered writing fiction? Enthralled by the compliment (and yet challenged,) I spent the week thinking about how I might add fiction writing to my platform to help tell some of the untold stories of the urban world I know. Curious characters I have known flashed through my head and I struggled to figure out how to create a fictional story out of them. When it finally came to be time to write, I could not start a story or even a personal essay on psychosis-like I usually do. When we arrive at the Butano State Park, I find myself sorting through a couple of different identities as a writer. I know I felt comfortable and artistic as the memoirist. I likewise have felt purposeful using my experience in group therapy to reconstruct psychosis into solvable components. It hasn’t been until I have been recently been struggling to get published on blogsites or magazines to increase my following that I have become down on my writing. As I watch my dog saunter up the fire trail, I remind myself that if I am going to publish a book that helps change the way clinicians work with psychosis, my voice and identity is going to have to be quite different. I am currently practicing changing my audience to providers and occasionally to family members. However, as I have done this, I don’t really feel I fit as a psychotherapist with an academic voice. It may sound strange, but I have an objection to the practice of using journal articles and research to reinforce what I say. I have learned that I don’t really learn well that way. I don’t trust research to tell the stories that I hear on the inner-city backward. We continue to ascend on a fire road until we reach a viewpoint we have been to some thirteen years ago. On that occasion, we had hiked with my father. I feel impressed that my father made it all the way up this road to the look-out back when he was sixty-five. It had been a lite day of hiking for me thirteen years ago but now I realize, I didn’t realize what I was putting him though. I reflect on how I get much more of my learning from listening to music than I do from journal articles. I think that why I like to write in a way that honors lived experience. I acknowledge that I fear to write a successful book that changes the way therapists approach work with psychosis, I need to use some degree of research to be accepted. Although I have created a therapy platform, I know that I don’t know how to write a readable book that promotes it. I know I need to read more theoretical books to get ideas for how to approach the writing. I just don’t want to do it. We continue to hike up the hill until we’ve been out for two hours. Our dog suddenly bounds after a chipmunk and disappears down the gulley through the brush and we call after her to get her to come back. I feel that age is slowing me down. I used to be far more fit. It is time to turn around. When I read writers, who do get published in psychotherapy magazines, I feel like a different breed. Firstly, I am uncomfortable with writing a case study about the real experiences of my clients. Even if I disguise the name, it feels like a massive breach of their confidence. Additionally, when I hang out with therapists who might one day benefit from reading my book, I feel like a flagrant victim. I have taken a couple of courses in trauma from industry leaders and have learned that I disassociate around other therapists. Listening to industry leaders, I have felt alienated when they have made fun of “psychosis.” One talked angrily about people who are “reversed” or unable to benefit. “Why can’t they just accept help!” The presenter had continued, “you can see them when they come into the room, they are as clear as day.” Of course, I was feeling like the presenter was referencing me because the techniques weren’t working for me. In this way, the comments coming from the trauma gurus only further alienate me. I think about how I have sent essay after essay out for publication and received only rejections. It’s true sending stuff out is painful. I don’t like to wait 2-8 weeks or even four months for some journals to hear back. Sure, I could be more persistent. Still, some of my best personal essays are starting to feel like rehashing the same story again. And, no matter what angle I put on them, they don’t seem to make it into print. In many ways I treat writing as though it is an equalizer. It is my response to feeling bullied and invisible to mainstream people. I didn’t go to an Ivy League school, I went to a commuter campus. Being invisible happened to me in my family, during schooling, at work (for example, after fifteen years of work, I just got my first five-year chip,) and in my volunteer efforts. I write dreaming that one day people will hear me. In fact, this is the same weekend I have sent in edits to a well-known publisher to whom I have sent upward of fifty articles. Finally, they think I have put something together that they feel is worth a response. However, in doing so I face a challenge. Did I write to tell my true story, or did I write to tell the editor what I think they want to hear? This the dilemma was exactly what happened with my memoir. I had a deal with a publishing company, but the editors were not forthcoming with the fact that they didn’t like my views on racial inequality or male sexual abuse. In a sense, I saw it coming; but was living on a prayer. Then, in the last edit, they entirely removed those important themes from my work and I chose to break the contract and reclaim my work. Back at the car, my wife drives. We drive through the shadows of the redwood trees. Out on the highway, the late afternoon sun shimmers through the smoke. We head for a dog-friendly beach. I come across a Facebook dialogue in a group in which a group member was contemplating writing a fictional story about a childhood friend who was Native American. She received quite a talking to by the group about it being exploitative to tell a story about a marginalized culture when she was not from that culture. Perhaps some of the reason I have struggled throughout the day is that I was thinking I should be able to write fiction when it isn’t a good fit for me. As a white male, I work primarily with people of color and although I know their lives intimately, their experience is just not my story to tell. I know they have more social barriers to overcome than I. It is ironic, I think, that the one Facebook story I looked up happened to tell me what I needed to hear. I think for a spell about the lessons of the day. I write because I believe there is value in it. I likely have the smallest writing platform there is on the internet. I think I create quality content, but don’t attract followers. I know it is important not to let the expectations of others negate what one does and so I persist. I write to keep things simple and real. It occurs to me that this is my writing platform. In a few minutes, I will watch my dog spritz about in the sand. Now, I am using my writer’s block to sharpen it. I may have a long way to go but I have a lot of years to sharpen it until I get clicks and likes and the things I need to get published. Perhaps the stress of getting published is taking more of a toll than I like to admit. Perhaps, sometimes there is just too much going on to get a piece of writing completed. There is so much competition on the internet, it can be difficult to develop a following. Do not let that discourage you. It is worthwhile to connect even w/ a single reader.